James (Jay) McClelland is the Lucie Stern Professor in the Social Sciences, and Director of the Center for Mind, Brain and Computation at Stanford University. After receiving his Ph.D. in Cognitive Psychology from the University of Pennsylvania in 1975, McClelland joined the faculty of the University of California, San Diego. 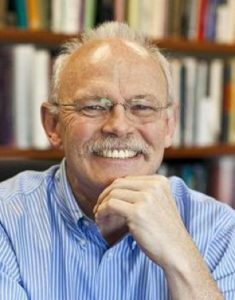 He moved to Carnegie Mellon University in 1984 as University Professor and the Walter Van Dyke Bingham Chair in Psychology and Cognitive Neuroscience. He was also the founding Co-Director of the Center for the Neural Basis of Cognition. In 2006 McClelland moved to the Department of Psychology at Stanford University, where he served as department chair. He is currently the Lucie Stern Professor in the Social Sciences, and the founding Director of the Center for Mind, Brain and Computation at Stanford. Over his long career, McClelland has contributed to both the experimental and the theoretical literatures in a number of areas, most notably in the application of connectionist, parallel distributed processing models to problems in perception, cognitive development, language learning, and the neurobiology of memory. His theoretical and experimental contributions have been instrumental in establishing an alternative to the traditional symbolic theory of the mind. Inspired by the massive parallelism found in brains, in the connectionist alternative cognition is conceptualized as the emergent result of interactions within interconnected networks of simple neuron-like units. , Local inhibitory and excitatory connections between units give rise to structured thoughts, mental schemas, and memories that are distributed across units. Learning is conceptualized as changes to the efficacy with which units excite or inhibit one another. McClelland and David Rumelhart formed the PDP Research group to pursue this connectionist program, and this group produced the two-volume book: Parallel Distributed Processing (Rumelhart, McClelland, and the PDP Research Group, 1986). These two volumes galvanized much of the cognitive science community to develop, explore and test new computational models of phenomena in learning, memory, language, and cognitive development. Much of Dr. McClelland’s work has fused connectionist computational modeling with empirical research in cognitive psychology and neuroscience. McClelland and Rumelhart jointly received the 1993 Howard Crosby Warren Medal from the Society of Experimental Psychologists, the 1996 Distinguished Scientific Contribution Award from the American Psychological Association, the 2001 Grawemeyer Prize in Psychology, and the 2002 IEEE Neural Networks Pioneer Award. McClelland also received the APS William James Fellow Award for lifetime contributions to the basic science of psychology, the David E. Rumelhart prize for contributions to the theoretical foundations of Cognitive Science, the NAS Prize in Psychological and Cognitive Sciences, and the Heineken Prize in Cognitive Science. He is a member of the National Academy of Sciences. In addition to his own research, McClelland has been an advocate for the sciences of the mind. He served on the leadership team of the Federation of Associations in Behavioral and Brain Sciences for several years, serving as its President for 2010-11. McClelland continues to support the advocacy mission of FABBS through the FABBS Advocacy Action Fund and through his service as a Council Representative to FABBS from the Cognitive Science Society. McClelland has also served as President of the Cognitive Science Society. He has been associate or senior editor for Cognitive Science, Neural Computation, Hippocampus, Neurocomputing, and Proceedings of the National Academy of Sciences. *FABBS would like to thank Dr. Ron Sun for nominating Dr. McClelland for this honor and for leading the effort. Would you like to honor Dr. McClelland? It’s not too late to have your name added to the list of donors! You can make your donation to Dr. McClelland’s In Honor Of… campaign at anytime.